The American badger (Taxidea taxus) [n 1] is a North American badger, somewhat similar in appearance to the European badger, although not closely related. It is found in the western and central United States, northern Mexico, and south-central Canada to certain areas of southwestern British Columbia. The American badger's habitat is typified by open grasslands with available prey (such as mice, squirrels, and groundhogs). The species prefers areas such as prairie regions with sandy loam soils where it can dig more easily for its prey. 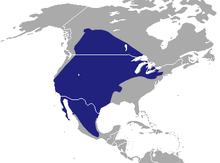 Recognized subspecies include: the nominate subspecies T. t. taxus, found in central Canada and central US; T. t. jacksoni, found in the southern Great Lakes region including southern Ontario; T. t. jeffersoni, in British Columbia and the western US; and T. t. berlandieri, in the southwestern US and northern Mexico. Ranges of subspecies overlap considerably, with intermediate forms occurring in the areas of overlap. In Mexico, this animal is sometimes called tlalcoyote. The Spanish word for badger is tejón, but in Mexico this word is also used to describe the coati. This can lead to confusion, as both coatis and badgers are found in Mexico. The American badger is a fossorial carnivore. It preys predominantly on pocket gophers (Geomyidae), ground squirrels ( Spermophilus), moles ( Talpidae), marmots (Marmota), prairie dogs (Cynomys), pika (Ochotona), woodrats (Neotoma), kangaroo rats (Dipodomys), deer mice ( Peromyscus), and voles ( Microtus), often digging to pursue prey into their dens, and sometimes plugging tunnel entrances with objects. The American badger is a significant predator of snakes including rattlesnakes, and is considered the most important predator of rattlesnakes in South Dakota. They also prey on ground-nesting birds, such as the bank swallow or sand martin (Riparia riparia) and burrowing owl (Athene cunicularia), and lizards, amphibians, carrion, fish, skunks ( Mephitis and Spilogale), insects, including bees and honeycomb, and some plant foods such as corn (Zea mais), peas, green beans, mushrooms and other fungi, and sunflower seeds (Helianthus). Badger forepaw with long, sharp claws. Primarily used for digging. Badgers can be found in the sagebrush deserts of eastern Oregon. As of 2014 [update], overdevelopment of American Badger habitat had resulted in reduced range, decreased prey, and forced badgers into contact with man foraging between fragments. Direct observations in Sonoma County, documenting habitat and badger sightings and foraging, reflect various ranges within the fragmented habitat areas from less than 1/2 mile to approximately 4 miles. Within these areas, the availability of prey and a fresh water source are key factors for the preferred habitat areas and ability to survive. Identifying and conserving habitat areas where there is year-round activity, along with identified burrowing patterns and observations of female badger territory for birthing and raising young have become critical factors in survival of the species. American badgers require cover for sleep, concealment, protection from weather, and natal denning. They typically enlarge foraged out gopher or other prey holes, or other animal burrows. Their dens range from about 4 feet to 10 feet in depth and 4 feet to 6 feet in width. A female American Badger may create 2 to 4 burrows in proximity with a connecting tunnel for concealment and safety for her young. Displaced soil from digging out the burrow characteristically appears in front of the burrow entrance, and a view from a distance reveals a mound-like roof of the burrow, with the living and concealment space created underneath the raised-roof appearing mound. ^ Helgen, K. & Reid, F. (2016). "Taxidea taxus". The IUCN Red List of Threatened Species. IUCN. 2016: e.T41663A45215410. doi: 10.2305/IUCN.UK.2016-1.RLTS.T41663A45215410.en. Retrieved 10 November 2017. ^ Wozencraft, W.C. (2005). "Order Carnivora". In Wilson, D.E. ; Reeder, D.M (eds.). Mammal Species of the World: A Taxonomic and Geographic Reference (3rd ed.). Johns Hopkins University Press. p. 619. ISBN 978-0-8018-8221-0. OCLC 62265494. ^ Law, C. J.; Slater, G. J.; Mehta, R. S. (2018-01-01). "Lineage Diversity and Size Disparity in Musteloidea: Testing Patterns of Adaptive Radiation Using Molecular and Fossil-Based Methods". Systematic Biology. 67 (1): 127–144. doi: 10.1093/sysbio/syx047. ^ "Taxidea". funet.fi. Retrieved 2007-08-07. ^ a b c d e f g h Long, Charles A. (1972). "Taxidea taxus" (PDF). Journal of Mammalogy. 26 (26): 1–4. doi: 10.2307/3504047. JSTOR 3504047. Archived (PDF) from the original on 13 July 2007. Retrieved 2007-08-07. ^ Long, Charles A. (1972). "Taxonomic Revision of the North American Badger, Taxidea taxus". Journal of Mammalogy. Journal of Mammalogy. 53 (4): 725–759. doi: 10.2307/1379211. JSTOR 1379211. ^ Feldhamer, George A.; Bruce Carlyle Thompson; Joseph A. Chapman (2003). Wild Mammals of North America: Biology, Management, and Conservation. JHU Press. p. 683. ISBN 0-8018-7416-5. ^ Minta, S. C., Minta, K. A., & Lott, D. F. (1992). Hunting associations between badgers (Taxidea taxus) and coyotes (Canis latrans). Journal of Mammalogy, 73(4), 814-820. ^ Quinn, J. H. (2008). The ecology of the American badger Taxidea taxus in California: assessing conservation needs on multiple scales. University of California, Davis. ^ Harlow, H. J., Miller, B., Ryder, T., & Ryder, L. (1985). Energy requirements for gestation and lactation in a delayed implanter, the American badger. Comparative Biochemistry and Physiology Part A: Physiology, 82(4), 885-889. ^ American Society of Mammalogists Staff; Smithsonian Institution Staff (1999). The Smithsonian Book of North American Mammals. UBC Press. p. 179. ISBN 0-7748-0762-8. ^ Michener, Gail R. (2004). "Hunting techniques and tool use by North American badgers preying on Richardson's ground squirrels". Journal of Mammalogy. 85 (5): 1019–1027. doi: 10.1644/BNS-102. JSTOR 1383835. ^ Klauber, Lawrence Monroe (1997). Rattlesnakes: Their Habits, Life Histories, and Influence on Mankind. Volume 1. 2nd ed. Berkeley (California): University of California Press. p. 1076. ISBN 0520210565. ^ "Why coyotes and badgers hunt together". mnn.com. ^ "Do coyotes and badgers work together to find food?". howstuffworks.com. 6 January 2009. ^ "Spotted! A Coyote and Badger Hunting Together". fws.gov. ^ a b c d e f g Lindzey, Frederick G. (1982). "Badger: Taxidea taxus", pp. 653–663 in Chapman, Joseph A.; Feldhamer, George A., eds. Wild mammals of North America: Biology, management, and economics. Baltimore, MD: The Johns Hopkins University Press. ISBN 0801874165. ^ a b Messick, John P.; Hornocker, Maurice G. (1981). "Ecology of the Badger in Southwestern Idaho". Wildlife Monographs. 76 (76): 1–53. JSTOR 3830719. ^ a b Bird, Ralph D. (1930). "Biotic communities of the aspen parkland of central Canada". Ecology. 11 (2): 356–442. doi: 10.2307/1930270. JSTOR 1930270. ^ Sargeant, Alan B.; Warner, Dwain W. (1972). "Movements and denning habits of a badger". Journal of Mammalogy. 53 (1): 207–210. doi: 10.2307/1378851. ^ Lindzey, Frederick G. (1978). "Movement patterns of badgers in northwestern Utah". Journal of Wildlife Management. 42 (2): 418–422. doi: 10.2307/3800282. JSTOR 3800282. ^ Morris, Meredith J.; Reid, Vincent H.; Pillmore, Richard E.; Hammer, Mary C. (1977). "Birds and mammals of Manitou Experimental Forest, Colorado". Gen. Tech. Rep. RM-38. Fort Collins, CO: U.S. Department of Agriculture, Forest Service, Rocky Mountain Forest and Range Experiment. ^ Gibson, David J. (1989). "Effects of animal disturbance on tallgrass prairie vegetation". American Midland Naturalist. 121 (1): 144–154. doi: 10.2307/2425665. JSTOR 2425665. ^ Tyser, Robin W. (1990). "Ecology of fescue grasslands in Glacier National Park", pp. 59–60 in Boyce, Mark S.; Plumb, Glenn E. (eds.) National Park Service Research Center, 14th annual report. Laramie, WY: University of Wyoming, National Park Service Research Center. ^ Skinner, Scott (1990). "Earthmover". Wyoming Wildlife. 54 (2): 4–9. ^ "Species at Risk Act: List of Wildlife Species at Risk". Retrieved 14 March 2013. ^ "Mammal Species of Special Concern". dfg.ca.gov. Archived from the original on 23 November 2010. Retrieved 27 November 2010. Whitaker, John O. (1980-10-12). The Audubon Society Field Guide to North American Mammals. Alfred A. Knopf. p. 745. ISBN 0-394-50762-2. Wikimedia Commons has media related to Taxidea taxus. Miller, Ira. "Montana Animal Field Guide". Archived from the original on 30 June 2007. Retrieved 2007-08-04. Streube, Donald. "American Badger, Idaho Museum of Natural History". Archived from the original on 4 August 2007. Retrieved 2007-08-04. "American Badger, The University of Texas at El Paso". The University of Texas at El Paso. Archived from the original on 2007-06-07. Retrieved 2007-08-04.